This Die-namics coordinates with the Town Bear stamp set for perfectly sized die cuts every time. It is open inside to allow you to stamp then cut OR cut then stamp. This feature makes the Die-namics lighter weight and allows for easier removal from the die. This 9 piece set includes: Bears (3) 1 1/4" x 1 3/4", 1 1/8" x 1 3/4", 1 3/8" x 1 3/4", Houses (2) 1" x 1 3/4", 7/8" x 1 3/4", Trees (2) 1 1/8" x 1 3/8", 7/8" x 1 1/8", Signs (2) 5/8" x 7/8", 5/16" x 7/8". MFT Die-namics dies are our very own EXCLUSIVE, American made line of steel dies. This Die-namics coordinates with the Wild About You stamp set for perfectly sized die cuts every time. It is open inside to allow you to stamp then cut OR cut then stamp. This feature makes the Die-namics lighter weight and allows for easier removal from the die. This 4 piece set includes animals measuring: 2" x 1 7/8", 2 3/8" x 2 1/4", 1 1/8" x 2 3/8", 2 7/8" x 1 3/8". MFT Die-namics dies are our very own EXCLUSIVE, American made line of steel dies. This Die-namics coordinates with the You Float My Boat stamp set for perfectly sized die cuts every time. It is open inside to allow you to stamp then cut OR cut then stamp. This feature makes the Die-namics lighter weight and allows for easier removal from the die. In addition, we've included a perfect anchor die to use as an alternative to a stamped and die-cut image. This 4 piece set includes: Boats (2) 1 1/2" x 2 1/8", 1 5/8" x 1 3/4", Anchors (2) 1/2" x 5/8, 5/8" x 3/4". This Die-namics coordinates with the Woodland Friends stamp set for perfectly sized die cuts every time. It is open inside to allow you to stamp then cut OR cut then stamp. This feature makes the Die-namics lighter weight and allows for easier removal from the die. This 5 piece set includes: Side-facing squirrel 1 7/8" x 1 7/16", Front-facing squirrel 1 7/16" x 1 7/16", Hedgehog 1" x 13/16", Bunny 1 1/2" x 1 3/4", Fox 2 1/8" x 1 3/4". This Die-namics coordinates with the Beary Big Adventure stamp set for perfectly sized die cuts every time. It is open inside to allow you to stamp then cut OR cut then stamp. This feature makes the Die-namics lighter weight and allows for easier removal from the die. This 11 piece set includes: Bear 2 1/8" x 2 1/2", Hills (2) 1 7/8" x 1 1/8", 1 1/4" x 3/4", Trees (2) 3/4" x 1 1/2", 3/4" x 1 7/8", Clouds/bushes (2) 1 1/4" x 3/4", Flowers (4) 5/8" x 5/8", 1/2" x 1/2", 3/8" x 3/8", 7/16" x 5/8". Use the Bottlecaps Die-namics to easily create a row of five peek-a-boo holes in your card front or to create die-cut bottlecaps with perfectly sized interior circles for layering. Combine with the Bottlecap Letters and Numbers to spell out a simple greeting or sentiment. This 2 piece set coordinates with the Soda Pop Bottles Die-namics, Bottlecap Letters Die-namics, Bottlecap Numbers Die-namics, and Soda Pop stamp set and includes: Bottlecaps 4 7/8" x 7/8" (individual bottlecaps 7/8"), Circles 4 3/4" x 3/4" (individual circles 3/4"). Drape a festive banner element across your card fronts with this multipurpose banner design. The curved stitched "string" creates the base of your design while the single piece banner die produces a negative that allows you to perfectly position your individual banner pieces. This 2 piece set includes: String 5 5/8" long, Banner die 5" creating (9) individual 3/8" x 1/2" banner elements. MFT Die-namics dies are our very own EXCLUSIVE, American made line of steel dies. This Die-namics coordinates with the Cook up Some Fun stamp set for perfectly sized die cuts every time. It is open inside to allow you to stamp then cut OR cut then stamp. This feature makes the Die-namics lighter weight and allows for easier removal from the die. The Cook up Some Fun Die-namics measures 1 7/8" x 2 3/4". MFT Die-namics dies are our very own EXCLUSIVE, American made line of steel dies. This Die-namics coordinates with the Delightful Dinosaurs stamp set for perfectly sized die cuts every time. It is open inside to allow you to stamp then cut OR cut then stamp. This feature makes the Die-namics lighter weight and allows for easier removal from the die. This 5 piece set includes dinosaurs measuring 2 5/8" x 1 3/4", 2 1/8" x 2", 2 1/8" x 1 3/8", 1 7/8" x 1 1/4", 2 5/8" x 2 1/2". MFT Die-namics dies are our very own EXCLUSIVE, American made line of steel dies. Essential Sentiments and More Essential Sentiments nestle perfectly into a variety of die-cut options and with the introduction of the Essential Speech Bubbles Die-namics, they have yet another fun home to reside in. This trio includes speech bubbles in three different sizes and pointing both left and right providing for the perfect opportunity to showcase a single sentiment, or create a conversation! This 3 piece set includes speech bubbles measuring: 3 3/4" x 11/16", 2 3/4" x 11/16", 2" x 11/16". MFT Die-namics dies are our very own EXCLUSIVE, American made line of steel dies. This Die-namics coordinates with the Flamazing stamp set for perfectly sized die cuts every time. It is open inside to allow you to stamp then cut OR cut then stamp. This feature makes the Die-namics lighter weight and allows for easier removal from the die. This 17 piece set includes: flamingos (3) 2" x 2 1/8", 2 1/8" x 1 3/4", 1 1/2" x 2 5/8", Wings (2) 1/2" x 3/4", Tree 2 1/4" x 2 7/8", Coconuts 1/2" x 1/2", Flowers with stem (2) 3/8" x 11/16", 5/16" x 5/8", Flower trio 3/4" x 11/16", Flower heads (3) 5/8", 1/2", 3/8", Butterfly 1/2" x 1/2", Leaves (2) 5/16" x 1/2", Foliage 3/8" x 5/8". MFT Die-namics dies are our very own EXCLUSIVE, American made line of steel dies. This Die-namics coordinates with the Frightful Friends stamp set for perfectly sized die cuts every time. It is open inside to allow you to stamp then cut OR cut then stamp. This feature makes the Die-namics lighter weight and allows for easier removal from the die. The mound of dirt die has a slit in it that allows the characters to pop up through the slit making it appear that they are breaking out of their grave! The Frightful Friends Die-namics includes: Bride of Frankenstein 1 1/4" x 3 1/16", Dracula 2 1/4" x 2 11/16", Frankenstein 1 5/16" x 2 7/8", Fence 1 11/16" x 1 7/16", Candle 3/8" x 1 5/16", Grass (3) 1 7/16" x 9/16", 11/16" x 5/8", 3/4" x 3/4", Bats (2) 13/16" x 3/8", 5/8" x 5/16", Mound of dirt 2 1/8" x 7/16". Hello? Was it this Die-namics you were looking for? Dropping a line has neverbeen easier. Everyone loves getting happy mail and a quick hello doesn't require a lot of intense crafting time! The beautiful script font and bold sizing means nothing else is necessary if you don't want to accessorize further. And really, how many words are more important to the English language than a simple "hello"? Trust us, you need this Die-namics in your collection! The Hello Die-namics measures 2 1/2" x 1 5/8". The stunning Mesmerizing Mandala Die-namics creates a beautifully ornate option for layering and accenting. Use a metallic finish paper to mimic a filigree accent for your cards and projects. This six-point design also can be used to die cut a magnificent, bold snowflake for wintry projects. The Mesmerizing Mandala Die-namics measures 3 7/8". MFT Die-namics dies are our very own EXCLUSIVE, American made line of steel dies. Die-namics dies work with most tabletop die cutting machines such as the Big Shot & Cuttlebug. Mom, step-mom, grandmom, like-a-mom... they all deserve to be celebrated in a BIG way. That's where we come in! This bold "mom", in both uppercase and lowercase versions, makes an unforgettable impact. Because the letters in each version are etched together in a single die, you can use the negative to perfectly place your die-cut letters or as an element all on its own. Mix and match with sentiments in the All About Mom stamp set to create an endless array of cards for all the moms in your life. This 2 piece set includes: Uppercase 3 5/8" x 1", Lowercase 3 3/16" x 11/16". MFT Die-namics, our very own exclusive American-made line of steel dies. 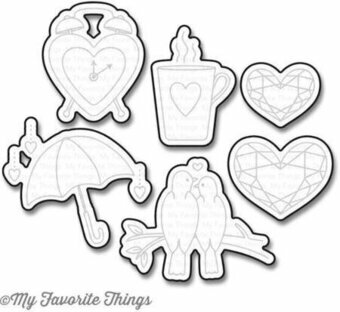 Die-namics dies work with your favorite die-cutting machine. This Die-namics coordinates with the More Monsters stamp set for perfectly sized die cuts every time. It is open inside to allow you to stamp then cut OR cut then stamp. This feature makes the Die-namics lighter weight and allows for easier removal from the die. This 6 piece set includes monsters measuring: 1 1/4" x 1 5/8", 1 3/8" x 1 7/8", 1 1/8" x 1 3/4", 1 3/4" x 1 5/8", 1 1/2" x 1 5/8", 1 3/4" x 1 7/8". MFT Die-namics dies are our very own EXCLUSIVE, American made line of steel dies. This Die-namics coordinates with the Once upon a Time stamp set for perfectly sized die cuts every time. The dies are open inside to allow you to stamp, then cut OR cut, then stamp. This feature keeps our Die-namics lightweight and allows for easy removal of the die cut from the die. Also included with this set is a rein die that allows you to hook up the carriage and horse in lieu of using the stamped rein and coordinating die. The 17 piece Once upon a Time set includes: Princess with hat 1 1/2" x 2 3/8", Princess with bouquet 1 3/8" x 2 1/4", Castle 1 7/16" x 1 11/16", Carriage 1 13/16" x 1 11/16", Horse 1 9/16" x 1 5/8", Unicorn 1 13/16" x 1 1/2", Rein 1" x 1/4", Stamped rein 1 1/16" x 1/4", Bird 9/16" x 5/8", Crown 9/16" x 5/8", Butterflies (2) 5/8" x 1/2", 9/16" x 7/16", Flowers (2) 3/8" x 9/16", 3/8" x 5/8", and Hearts (3) 3/8" x 7/16", 1/4" x 5/16", 1 1/4" x 1/4". Pair the Open Road Die-namics with Town Bear, or any number of other designs featuring vehicles and scene-building elements to easily incorporate movement into your card designs. Open Road features two road options - one straight away that can be used vertically or horizontally, the other to head-on to create perspective. Use the roads alone for simple scene building or use the coordinating dies to add perfectly sized and shaped channels for vehicle movement. This 4 piece set includes: Roads (2) 5 1/2" x 3/4", 5 1/2" x 1 1/2", Slider channels (2) 2 7/8" x 1/4", 3" x 1/4'. MFT Die-namics dies are our very own EXCLUSIVE, American made line of steel dies. This Die-namics coordinates with the Polar Pals stamp set for perfectly sized die cuts every time. It is open inside to allow you to stamp then cut OR cut then stamp. This feature makes the Die-namics lighter weight and allows for easier removal from the die. 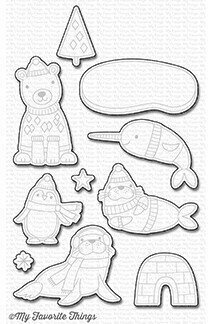 This 10 piece set includes: Seals (2) 2 1/8" x 1 1/2", 2 1/4" x 1 3/4", Polar bear 1 3/8" x 2 1/4", Penguin 1 1/2" x 1 1/2", Narwhal 2 3/8" x 1 1/4", Ice floe 2 1/2" x 1 1/8", Tree 7/8" x 1 1/4", Igloo 1 3/8" x 1 1/8", Stars (2) 1/2" x 1/2", 3/8"x 3/8". MFT Die-namics dies are our very own EXCLUSIVE, American made line of steel dies.